Ever been bored to death going up slow water elevators or having to walk long, uninteresting paths? Just want to get to your location? Then the teleportation pad would be a solution to that! The texture would be a slab. The edges would be a purpur texture, while the centre would be a blue nether portal. You place down a teleportal, and right click it. It will come up with a GUI that shows the coordinates of every teleportal within a 128-block radius (goes along y-axis as well). You choose the one you want to go to, and when you enter the teleportal, it will take you there. You may argue that this could allow you to teleportal into other players' bases in multiplayer, and that would be correct. This is where the protection feature comes in. In the GUI, you can select which teleportals in the radius can access yours, thus blocking out unwanted visitors. That was my little suggestion, and any criticism is welcome! These are cheap enough to be used en mass (which appears to be the intent) with the need for chorus fruit keeping the item far enough into the late game that its power level is not inappropriate. ★ Fairly minor, but I would suggest limiting the triggering of the pad to players (etc???) being located on the central "blue nether portal" section of the block. ★ It is unclear whether a given pad can link to only one or more than one other pad at a given time. ★ It is unfortunate that named blocks lose their names when placed (https://minecraft.gamepedia.com/Anvil_mechanics#Renaming) as this would make managing a system easier than using coordinates. Whether having the blocks act like "Chests, trapped chests, shulker boxes, furnaces, hoppers, droppers, dispensers, minecarts with chests, minecarts with hoppers, enchantment tables, and brewing stands [which] will display the name in their GUI when placed" could be done without increasing lagginess excessively is unknown. ★ However, I am not a fan of using a GUI to create the links. Allowing any TPK to reset a pad would be more convenient, but could be employed to redirect unsuspecting users to an unwanted location. Basing the ability to reset pads on the identity of the player holding the TPK (essentially binding pads to specific players) might make the networks too secure… as well as too hard to modify if the required player was unavailable. Requiring the TPK used for a reset to have exactly the same name as the previous TPK seems a reasonable compromise as this information could be kept secret or shared as desired. Making it cheap [ender pearl / end rod / chorus fruit & renaming on an anvil to activate] would make telepad networks more common. Making it expensive [nether star / end rod / enderman head & permitting only a single naming on an anvil] would make the number of players with telepad networks (or at least control of such) far more limited. Simply having the sending pad fail to function would allow an added measure of base security [telepad into one's base then use a sticky piston to block the entry pad] at the cost of providing an easy method of disabling pads. An intriguing suggestion, about which I look forward to further discussion. 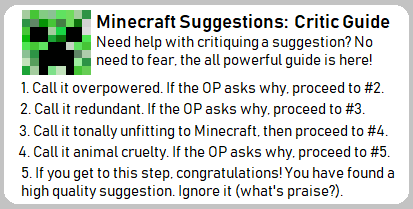 I think this is overpowered, but I won't get too many negatives because I think the initial concept has potential. I believe the teleportal shouldn't take you to any coordinate, even within a 128 radius. I understand that having that feature was essential to your hook- simplify getting your items back. But Mojang has already stated using coordinates is "cheating", so I don't think they would do this. What I could see them doing in an attempt to promote balanced teleportation is allowing you to jump from teleportals to teleportal, as long as you are in the same dimension. By this I mean you'd create two teleportals, and these could be "linked" so whenever you touch one you come out the other side. Needless to say, it would simply mob grinders. And really help with base connectivity. The downside is it won't help much with exploring dangerous areas such as where you would die. But I think the whole "retrace your steps" thingy is intentional and supposed to make you not want to die. I think it'd be far more balanced if the teleportal had to set up beforehand.